American Dream: DuVernay's drama puts MLK in the context of the ordinary heroes who helped realize his vision. The problem with too many historical dramas is that they present foregone conclusions. We all know who won that war or that struggle for hearts and minds, even if we're fuzzy on how. Give us a staid, pictorial depiction of events, and we tune out. At their best, though, historical dramas preserve the ragged volatility of life lived moment by moment, finding ways to fool us — even briefly — into forgetting we know what we know. Spielberg's Lincoln reminded us that the passage of the Thirteenth Amendment was anything but a foregone conclusion to those who made it happen. Now director Ava DuVernay (Sundance-honored Middle of Nowhere) brings to life a more recent pivotal moment in American civil-rights history — the 1965 campaign for voting rights in Selma, Ala. And she demonstrates that she, too, knows how to make us forget the conclusion and focus on the conflict. We've all seen footage of the Selma marches presented in elegiac or reverential ways. But before the state troopers started beating unarmed marchers on Bloody Sunday, before cameras shot the footage that would be seen around the world, there were moments of fraught waiting, of terror, of uncertainty. And before that, there were tense months of strategizing by Martin Luther King Jr. (David Oyelowo) and his cohorts in the Southern Christian Leadership Conference. Selma captures those befores, with an emphasis on the human element. When DuVernay and screenwriter Paul Webb stage the notorious 1963 Birmingham church bombing, they show us the young victims engaged in lively girl talk seconds before their deaths, emphasizing both their vitality and the utter unexpectedness of a terrorist attack. 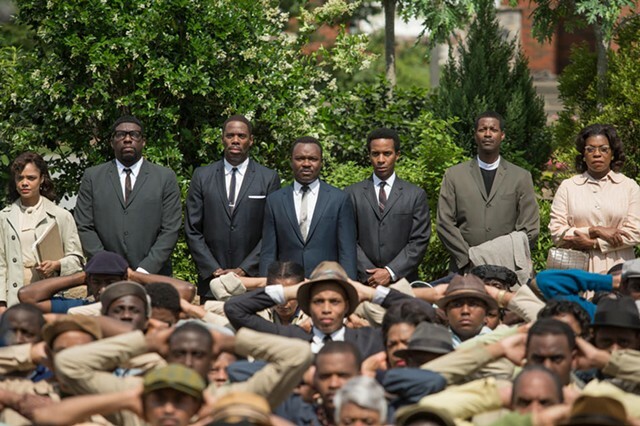 Martyrdom, Selma reminds us, is rarely a choice. Not even for King, who knew all too well that his activism could have tragic personal consequences. The film depicts King and his wife (Carmen Ejogo) struggling with that awareness in several powerfully acted scenes. It acknowledges that "drama" is a powerful activist weapon, and drama can entail the provocation of violence. (We see King explaining to younger activists that the efficacy of the Selma campaign will depend on the brutality of the town's sheriff.) Even nonviolent resistance, then, is no complacent enterprise. Oyelowo captures King's preacherly cadences, but also the moments of doubt in which he wonders if certain successes are too dearly bought. Most importantly, though, Selma reminds us where the violence started — with the insidious, everyday practice of denying African Americans their legal right to vote. Historians may debate whether Lyndon B. Johnson (Tom Wilkinson) gets enough credit in the film, but only a fool would take him for its villain. While LBJ comes across as a political animal juggling ideals and practicalities, and George Wallace (Tim Roth) as a whiny bigot, the real bad guy is the court clerk who blandly ensures that Annie Lee Cooper (Oprah Winfrey) can't participate in her nation's democracy. In other words, it's not a person, but a system made of people who shrug and don't challenge policies that favor them. At a key moment toward the film's end, DuVernay switches from her re-creation of the third march to actual historical footage. In too many Oscar-season movies, such a shift underlines the phoniness of the dramatization we've been watching. In Selma, showing the real marchers has a different effect: It reminds us where we stand in relation to them, in the "future." It reminds us of the systematic assumptions that underlie our own lives, and the systematic injustices we may have fought, suffered or helped perpetrate. Even before the final credits roll, scored to a song (John Legend and Common's "Glory") that references the Ferguson protests, the movie doesn't allow us to dismiss the past as past. It reminds us that we all live with the legacy of King's choices — and LBJ's, and Wallace's, and the anonymous marchers' and countermarchers' — right now.